This post will be short and sweet. I went to Bangkok. I spent 12 hours there. I didn’t sleep a wink. I left Bangkok. I got to my hostel, put my stuff down in my tiny windowless room, and then headed out. No dinner. No potty break. I had one thing on my mind: dancing! Destination: The Hop. 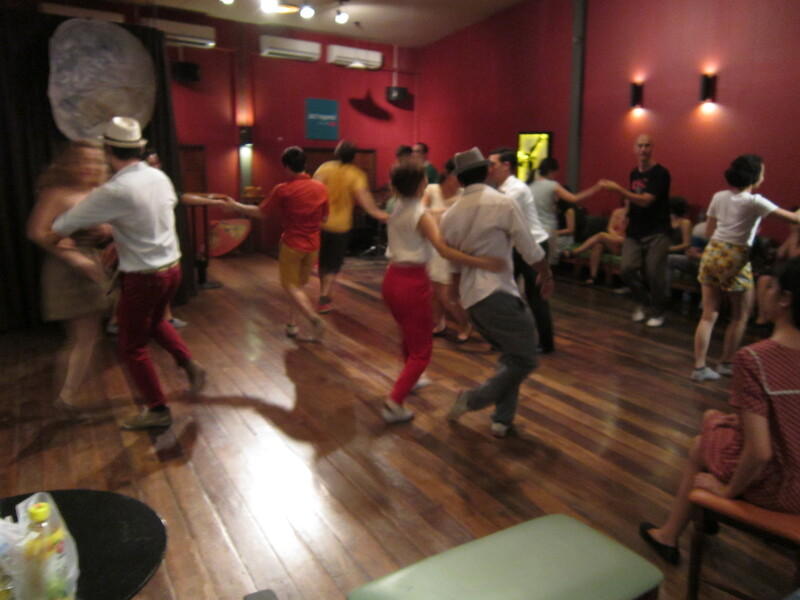 Bangkok’s swing scene is much smaller than Hong Kong’s and the night I went there were very few leads . I sat in disappointment as a small number of aggressive women danced with the same few guys over and over and thought I had wasted my time coming. Eventually though, the tides changed. They did this thing that reminded me so much of the church I grew up in. The owner, a jazzy-looking Korean woman, stood up and gave announcements and then asked if there were any visitors. I raised my hand and everyone clapped and welcomed me! I guess there are benefits in being smaller. Before I knew exactly what was happening, I found myself the dancer of honor in the middle of a rowdy dance circle. (If only they did that at church, too!) It was a dream come true. For my 28th birthday party I had gone swing dancing with friends, but hadn’t told anyone it was my birthday and was unfamiliar with the convention. By my 29th birthday, it was already too late. Anyway, I really wish that I had gotten photos of myself getting swung around between the best dancers in the room, but like I said, I didn’t know what was happening until it happened. It was really funny: the last guy that I danced with (pictured below in the maroon pants and fedora) had on the same color pants as me and EVERYONE thought that was something to shout about. EVERYONE. After that though, finding someone to dance with became a little easier since everyone knew I knew what I was doing. Around 11 I got back to my hostel. I met some guys from Taiwan who work for Acer at different places around the world: one in Indonesia, one in Kenya, and I forget where the last guy worked. I went back out to get “dinner” (potato chips) at 7-11 and then talked with the guys for a few hours. By the time I headed back to my windowless room there were only 2 hours before my flight to Bali. I worried that if I fell asleep I wouldn’t get up in time so I just stayed up and waited for my 3:30AM taxi to the airport. My taxi driver ended up being from Isaan, so we chatted in Lao all the way to Don Muang. He was so surprised a farang spoke his language!